The Muskoka Men’s Basketball League consists of six teams: Boone Plumbing Ballers, Bracebridge Medical Centre Thunder, Clear Lake Brewing Company, Family Place Restaurant & Pizza, Fike Masonry, Frosty Pint Pub, On The Docks Pub, and Raptors 705 Unity Group Financial. See below for weekly results and get full league standings here. Friends and family gathered at Gravenhurst High School to cheer on their favourite teams in final round playoff action. 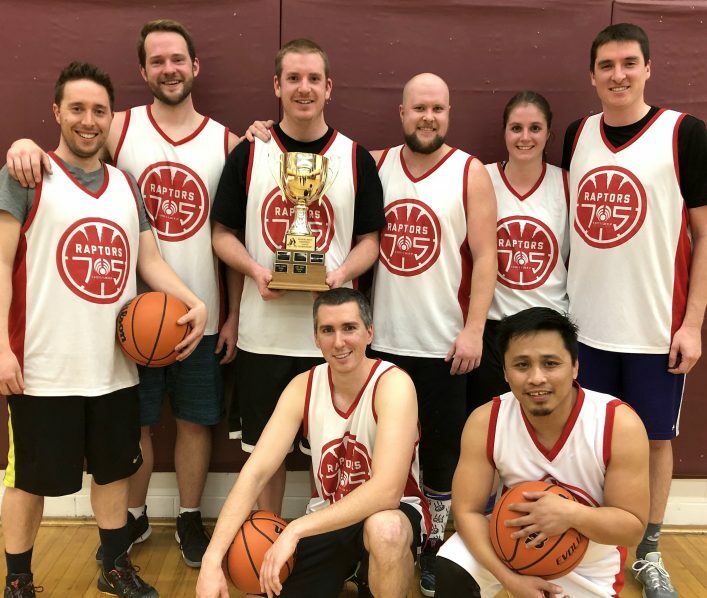 In a hard-fought game, Raptors 705 Unity Group Financial beat Fike Masonry winning 82 to 60 to become the new 2018-2019 Muskoka Men’s Basketball League Champions! In Round 2 playoff action Fike Masonry beat BMC Thunder 85 to 77. And Raptors 705 topped Family Place Restaurant 74 to 64. Championship Game between Raptors 705 and Fike Masonry is Monday, March 25 8:30 pm at Gravenhurst High School. All are welcome to come watch and cheer on the teams! Congratulations to Raptors 705 Unity Group Financial for finishing 1st place during the regular season. In Round 1 playoff action Family Place Restaurant bounced Boone Plumbing Ballers 82 to 59. Raptors 705 outpaced Clear Lake Brewing 67 to 53. Round 2 playoffs continue Monday, March 18. Muskoka Men’s Basketball League action continued as Family Place Restaurant beat On The Docks Pub 65 to 51. Raptors 705 bounced Frosty Pint Pub 94 to 65. Boone Plumbing Ballers topped Clear Lake Brewing 98 to 59. And BMC Thunder edged Fike Masonry 86 to 85. Muskoka Men’s Basketball League action continued as Boone Plumbing Ballers topped Frosty Pint Pub 90 to 83. Fike Masonry bounced On The Docks Pub fell 92 to 57. Raptors 705 defeated Clear Lake Brewing 103 to 72. And Family Place Restaurant fell to BMC Thunder 94 to 122. Muskoka Men’s Basketball League action continued as Raptors 705 outgunned Fike Masonry 91 to 85. Family Place Restaurant beat Boone Plumbing Ballers 82 to 69. On The Docks Pub lost to Frosty Pint Pub 60 to 68. And BMC Thunder defeated Clear Lake Brewing 82 to 72. Muskoka Men’s Basketball League action continued as Raptors 705 outpaced BMC Thunder 111 to 92. Family Place Restaurant beat Clear Lake Brewing 76 to 70. Fike Masonry defeated Frosty Pint Pub 94 to 84. And Boone Plumbing Ballers lost to On The Docks Pub 78 to 88. Muskoka Men’s Basketball League action continued as Fike Masonry defeated Clear Lake Brewing 64 to 45. BMC Thunder outgunned Boone Plumbing Ballers 84 to 68. Frosty Pint Pub squeaked by Family Place Restaurant 97 to 96. And Raptors 705 bounced On The Docks Pub 82 to 58. Muskoka Men’s Basketball League action continued as Frosty Pint Pub beat Clear Lake Brewing 73 to 69. Fike Masonry edged Boone Plumbing Ballers 82 to 81. And Raptors 705 overcame Family Place Restaurant 63 to 60. Muskoka Men’s Basketball League action continued as Boone Plumbing Ballers topped Frosty Pint Pub 86 to 80. Fike Masonry outpaced On The Docks Pub 72 to 53. And Raptors 705 bounced Clear Lake Brewing 83 to 36. Muskoka Men’s Basketball League action continued as Family Place Restaurant thumped On The Docks Pub 62 to 34. Frosty Pint Pub lost to Raptors 705 73 to 83. Clear Lake Brewing Company beat Boone Plumbing Ballers 58 to 52. And BMC Thunder outpaced Fike Masonry 78 to 65. Muskoka Men’s Basketball League action continued as Clear Lake Brewing Company topped On The Docks Pub 60 to 49. Frosty Pint Pub outpaced BMC Thunder 92 to 77. Boone Plumbing Ballers bounced Raptors 705 71 to 48. And Family Place Restaurant beat Fike Masonry 74 to 69. Muskoka Men’s Basketball League action continued as Boone Plumbing Ballers outpaced Family Place Restaurant & Pizza 83 to 66. Raptors 705 topped Fike Masonry 75 to 59. BMC Thunder beat Clear Lake Brewing Company 70 to 62. And On The Docks Pub came up short against Frosty Pint Pub 61 to 63. Muskoka Men’s Basketball League action continued as Raptors 705 topped BMC Thunder 71 to 67. Family Place Restaurant thumped Clear Lake Brewing Company 68 to 38. Frosty Pint Pub came up short against Fike Masonry 54 to 57. And Boone Plumbing Ballers beat On The Docks Pub 68 to 60. Muskoka Men’s Basketball League second week action continued as BMC Thunder squeaked by Boone Plumbing Ballers 82 to 81. Fike Masonry bounced Clear Lake Brewing Company 61 to 41. Frosty Pint Pub lost to Family Place Restaurant & Pizza 58 to 62. And Raptors 705 outpaced On The Docks Pub 74 to 56. Muskoka Men’s Basketball League returned to the hardwood! In first week action at Huntsville High School Frosty Pint Pub topped Clear Lake Brewing Company 59 to 55. The Raptors 705 Unity Group Financial outgunned Family Place Restaurant & Pizza 83 to 62. At Gravenhurst High School Fike Masonry fell to Boone Plumbing Ballers 62 to 70. And Bracebridge Medical Centre Thunder beat On The Docks Pub 69 to 61.